Michelangelo's The Creation of Adam (c. 1512), part of the Sistine Chapel ceiling, is considered an archetypal masterpiece of painting. 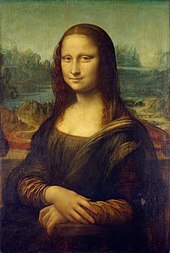 In painting, Leonardo da Vinci's Mona Lisa (c. 1503–06) is considered an archetypal masterpiece, though it was not produced for admission to a guild or academy. The form masterstik is recorded in English or Scots in a set of Aberdeen guild regulations dated to 1579, whereas "masterpiece" is first found in 1605, already outside a guild context, in a Ben Jonson play. "Masterprize" was another early variant in English. Federico Zuccari, Two Painter's Apprentices, 1609. They would have to produce a masterpiece to become masters at the end of their apprenticeships. Originally, the term masterpiece referred to a piece of work produced by an apprentice or journeyman aspiring to become a master craftsman in the old European guild system. His fitness to qualify for guild membership was judged partly by the masterpiece, and if he was successful, the piece was retained by the guild. Great care was therefore taken to produce a fine piece in whatever the craft was, whether confectionery, painting, goldsmithing, knifemaking, leatherworking, or many other trades. In London, in the 17th century, the Worshipful Company of Goldsmiths, for instance, required an apprentice to produce a masterpiece under their supervision at a "workhouse" in Goldsmiths' Hall. The workhouse had been set up as part of a tightening of standards after the company became concerned that the level of skill of goldsmithing was being diluted. The wardens of the company had complained in 1607 that the "true practise of the Art & Mystery of Goldsmithry is not only grown into great decays but also dispersed into many parts, so as now very few workmen are able to finish & perfect a piece of plate singularly with all the garnishings & parts thereof without the help of many & several hands...". The same goldsmithing organization still requires the production of a masterpiece but it is no longer produced under supervision. In Nuremberg, Germany, between 1531 and 1572, apprentices who wished to become master goldsmith were required to produce columbine cups, dice for a steel seal, and gold rings set with precious stones before they could be admitted to the goldsmiths' guild. If they failed to be admitted, then they could continue to work for other goldsmiths but not as a master themselves. In some guilds, apprentices were not allowed to marry until they had obtained full membership. In its original meaning the term was generally restricted to tangible objects, but in some cases, where guilds covered the creators of intangible products, the same system was used. The best-known example today is Richard Wagner's opera Die Meistersinger von Nürnberg (1868), where much of the plot is concerned with the hero's composition and performance of a "masterpiece" song, to allow him to become a meistersinger in the (non-commercial) Nuremberg guild. This follows the surviving rulebook of the guild. In modern use, a masterpiece is a creation in any area of the arts that has been given much critical praise, especially one that is considered the greatest work of a person's career or to a work of outstanding creativity, skill, profundity, or workmanship. For example, the novel David Copperfield is considered by many as a masterpiece written by author Charles Dickens. ^ "The Theft That Made Mona Lisa a Masterpiece". NPR. July 30, 2011. Retrieved February 15, 2019. ^ A History of the Goldsmiths' Company. The Goldsmiths' Company. Retrieved 30 December 2014. ^ Goldsmiths' Company Apprenticeship Programme. Archived 2014-12-30 at Archive.today The Goldsmiths' Centre. Retrieved 30 December 2014. ^ Cup, Silver, room 69, case 25. Victoria & Albert Museum. Retrieved 30 December 2014. ^ Forster, John (1976). "VII". Life of Charles Dickens. London: Everyman's Library. p. 6. ISBN 0460007823. ^ "John Forster, The Life of Charles Dickens". Classic Literature. Retrieved 26 June 2012. ^ Monod, Sylvère (1968). Dickens the Novelist. University of Oklahoma Press. ISBN 978-0806107684.